The CT7000 microprocessor-based circular chart recorder measures, displays, records, and controls up to two process variables from a variety of inputs. Record and control functions, alarm settings and other parameters are easily configured via the keys on the front cover and self-prompting displays. 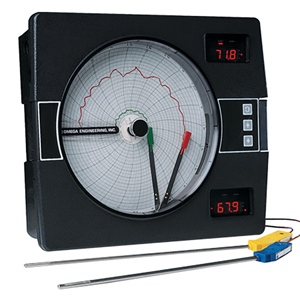 The CT7000 offers a 250 mm (10") circular chart and 4-digit LED display(s). Display resolution and filters are user configurable. Two alarm settings are provided for each pen. Each alarm is user configurable as process high or low, deviation from setpoint (above or below), or deviation band (open or closed within band). An alarm hysteresis adjustment is user configurable. Optional control capability includes on/off and PID control. Output type selections include SPST relay, SSR driver and 4-20 mAdc (user configurable to 0-20 mAdc). Also, 4-20 mAdc outputs may be used for retransmitting the process value. Digital communications is optional. Use the "Part Number Builder" below to get pricing for chart paper. 注: * Other std ranges: 0-600/24, 0-400/24, 0-200/24, 30-230F/24, 0-100/7, 0-1000/24, 0-300/24, 0-300/7, 0-800/24, 0-2000/24, -50-50/7, 0-200/7, 0-2500/24, 0-1200/24, 60-180F/24, 0-14PH/24, -50-50/24. Note: recorder may be supplied with other configurations of options. For RS-485 Communication Option: add suffix “-RST” to model number and $185 to price. For 230 Vac power option: add suffix “-230V” to model number and $59 to price. For CSA approval: add suffix “-CSA” and $12 to price.